The fused-core* particle technology was specially developed to produce hyper-fast chromatographic separation while avoiding the uncertainties associated with UHPLC. The father of the technique is dr. Jack Kirkland, widely regarded as one of the "founders" of HPLC. C4 ... 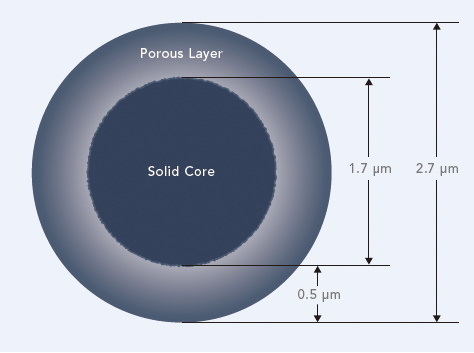 The world’s first 2.7-micron superficially porous silica particles with 1000 Angstrom pores for the separation of very large molecules such as monoclonal antibodies, large proteins, synthetic polymers, etc. C8 ... Separations are due primarily to hydrophobic interactions and differences in hydrophobicity among analytes. Excellent for a broad range of analytes. C18 ... Separations are due primarily to hydrophobic interactions and differences in hydrophobicity among analytes. Excellent for a broad range of analytes. Peptide ES-C18 ... Ideal for ultrafast and high resolution separation of peptides and polypeptides (≤ 15 kDa). Enhanced stability at low pH via sterically protected ligands up to 90 degrees C.
Phenyl-Hexyl ... Separations occur due to hydrophobic and pi-pi interactions. Enhanced retention and selectivity for aromatic and unsaturated analytes (especially those with electron-withdrawing groups and halogens). Compatible with highly aqueous mobile phases. HILIC ... Can be used in both HILIC and normal-phase modes. Enhanced sensitivity and peak shape for LC-MS analyses of basic analytes. PFP ... Separations take place due to multiple types and degrees of analyte interactions including hydrophobic, pi-pi, dipole-dipole, and hydrogen bonding. Can be used in HILIC mode (with more than 80% acetonitrile in mobile phase). Enhanced selectivity for stereoisomers. Compatible with highly aqueous mobile phases. RP-Amide ... Retention and selectivity due to hydrophobic and hydrogen bonding interactions. Less retentive than C18 and C8, except for analytes with proton-donor groups. Compatible with 100% aqueous mobile phases. Peptide ES-CN ... Provides strong dipole-dipole interactions with analytes and weak hydrophobic interactions. Suitable for use in reversed-phase, HILIC, and normal-phase modes. 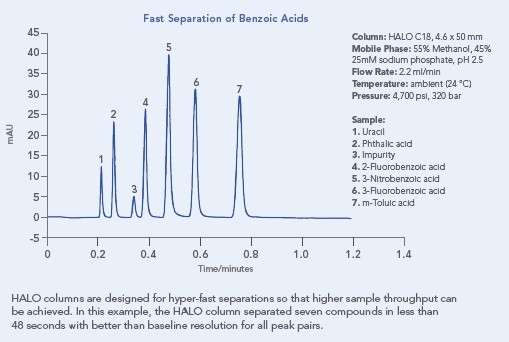 Rapid equilibration with low bleed for high throughput LC-MS applications. Extra stable bonding with sterically protected ligand provides improved stability and performance compared to conventional CN phases, especially at low pH (1-4). Protein C4 ... Dimethylbutylsilane, exhaustively endcapped and enhanced for high temperature stability. Phenyl-Hexyl ... Separations occur due to hydrophobic and pi-pi interactions. Enhanced retention and selectivity for aromatic and unsaturated analytes (especially those with electron-withdrawing groups and halogens). HALO C30 columns: best for fat/water soluble vitamins, carotenoids, lipids, steroids. 100 % aqueous compatibility.